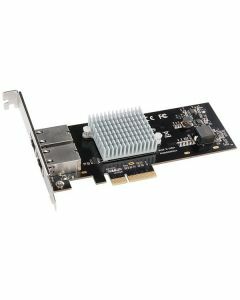 Add super high-speed 10Gb Ethernet to any computer with a PCIe slot or add to one of Sonnet's thunderbolt expansion chassis to any thunderbolt enabled computer. The Presto 10GbE 10GBase-T card enables you to connect your computer to high-speed infrastructure and storage without stepping down in speed. Setup is simple—after installing the low-profile card into an available x4 or larger PCIe slot in your computer, just download and install a driver, connect to the switch or device’s 10GbE ports via inexpensive CAT-6 or CAT-6A copper cabling at distances up to 55 or 100 meters, respectively, and then configure the card through the OS X® Network control panel or Windows Device Manager. This Sonnet solution is perfect for high-performance computing where low latency, high bandwidth, and low CPU overhead are required. Its increased throughput performance and low host-CPU utilization are achieved through functions such as flow control support, 64-bit address support for systems using more than 4GB of physical memory; and stateless offloads such as TCP, UDP and IPv4 checksum offloading, enabling your computer to perform better while large files transfers or high I/O operations take place. Wake-on-LAN support enables remotely waking your computer when you need it, and not wasting energy when you don’t. With its dual ports, this Sonnet adapter supports transparent failover to keep your computer connected in case a single cable is disconnected or one of the ports fails, and it also supports link aggregation for increased throughput. Got a Thunderbolt connection, but no PCIe slot? Presto 10GbE 10GBase-T is ideal for use in one of Sonnet's Echo Express or xMac Thunderbolt-to-PCIe card expansion systems—the combo enables you to add ultra-fast 10GbE network connections to any Mac® or Windows PC with a Thunderbolt 2 port.